That is typed correctly - peep this terrarium footstool. Wonder of all wonders- I truly thought when it comes to terrariums- I've seen it all. 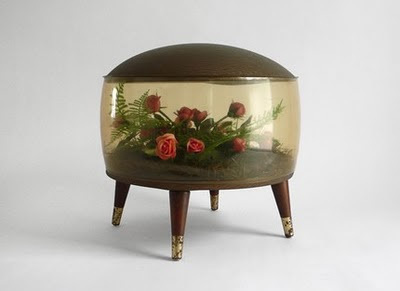 Enter Annalee and her blog ramblingsofagypsynomad and this utterly bizarre, utterly amazing terrarium-inspired footstool. I doubt live plants could live for long in it- but man o man. How could you not try? This vintage footstool dates from the 1960s and features a very unique inside! A clear plastic side reveals a terrarium complete with grass, leaves and pink flowers. With a brown vinyl top and wood and metal legs, it has a blow up nozzle to keep it looking great through the years. This vintage foot stool stays inflated, is in great condition and makes a truly unique addition to any space! Vintage item originally for sale at Hindsvik Etsy Shop.